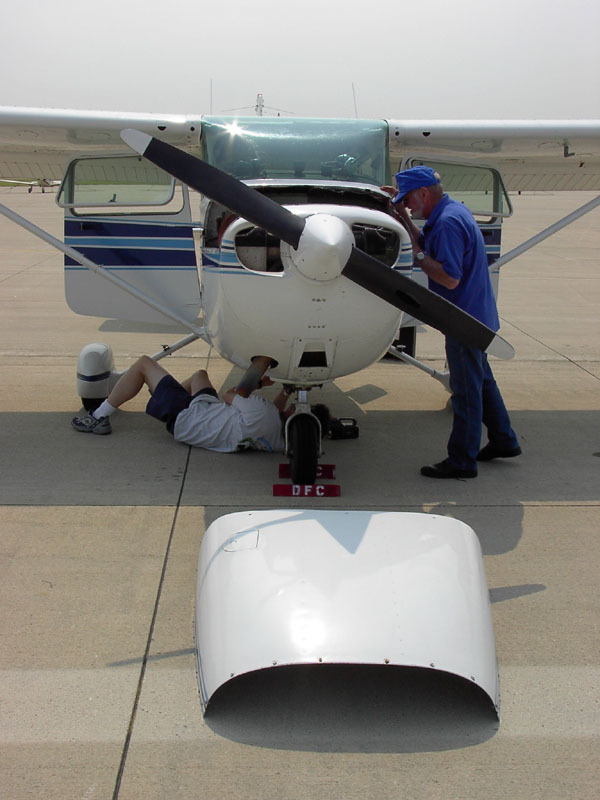 Our flying club decided we needed to get an additional Cessna 172. There were two likely candidates, one in Michigan and the other near Chicago. 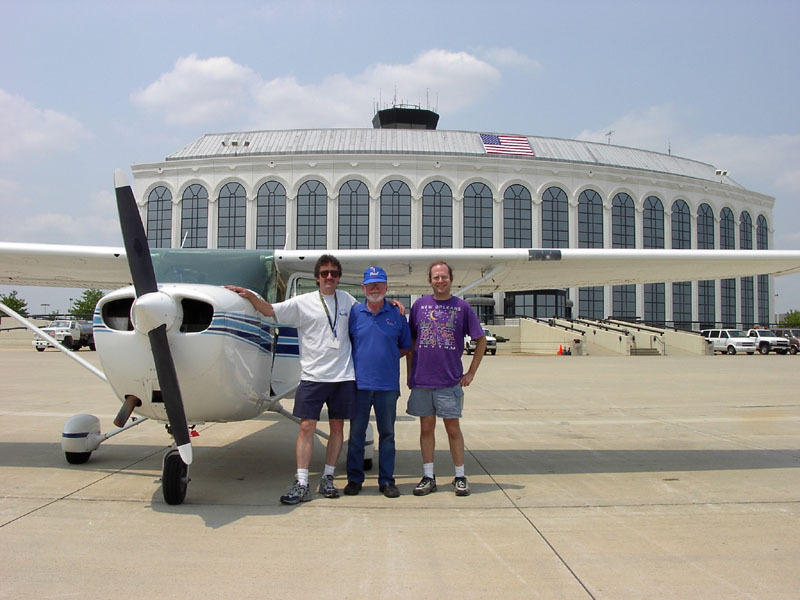 So, our chief pilot (Stick), chief instructor (David), and I took a trip west. I am a firm believer in combining business and pleasure if at all possible, at least if the business part is required. After a week of hot, crappy weather, we finally had a few clear days. 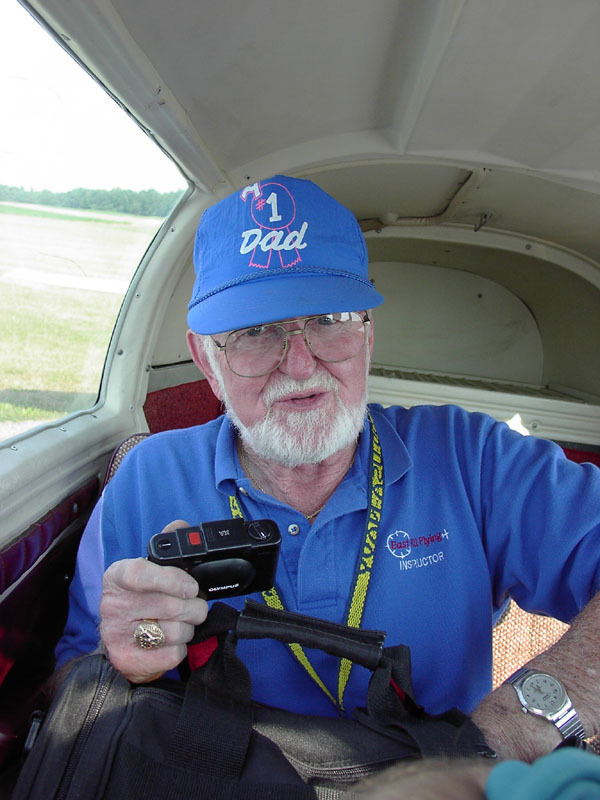 We took off in or Mooney (201) Friday afternoon, around 1pm, flying VFR at 8,500 feet. Our routing took us past Youngstown, Ohio and then by Cleveland. We had VFR flight following the whole way. 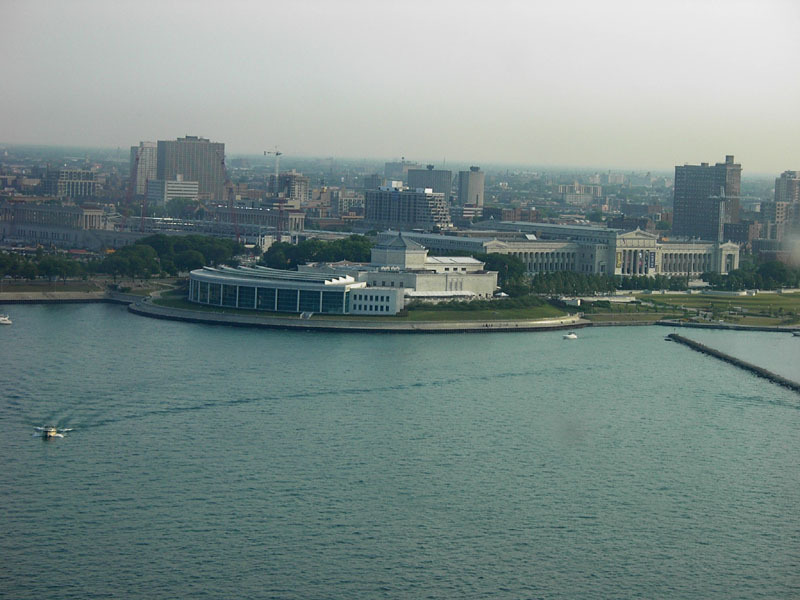 We had a really nice view of downtown Cleveland. 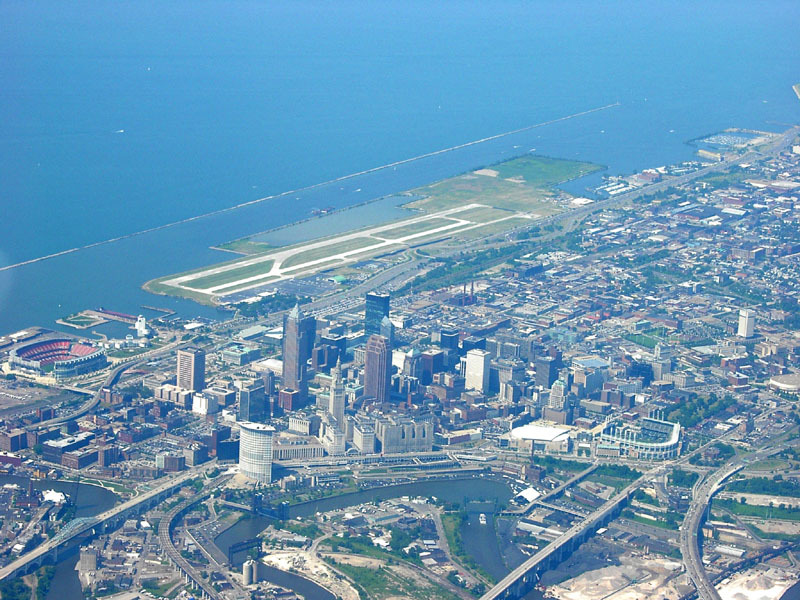 You can see Burke Lakefront Airport, the Cuyahoga River, both stadiums, as well as many of the buildings downtown (the Terminal Tower, the BP Building, etc.). 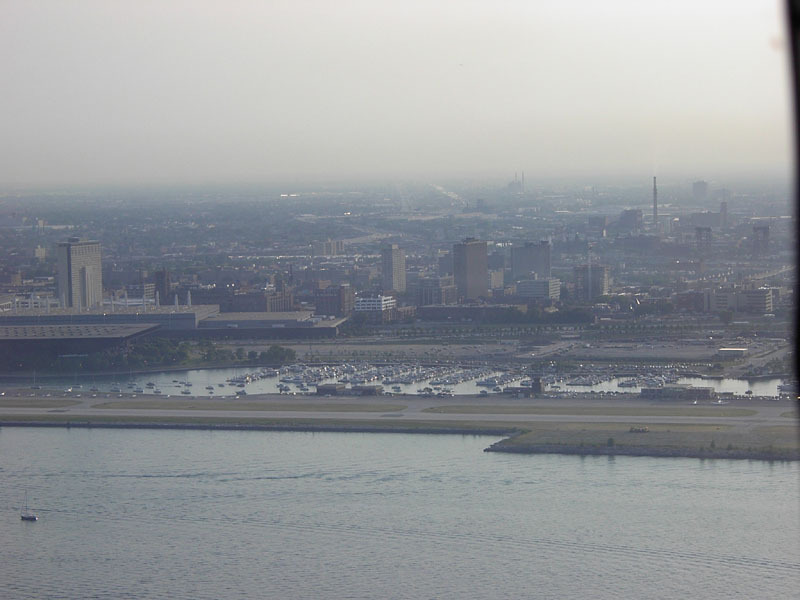 We got routed a little to the north to avoid traffic departing from Cleveland Hopkins airport, which gave us a better view of the shoreline. 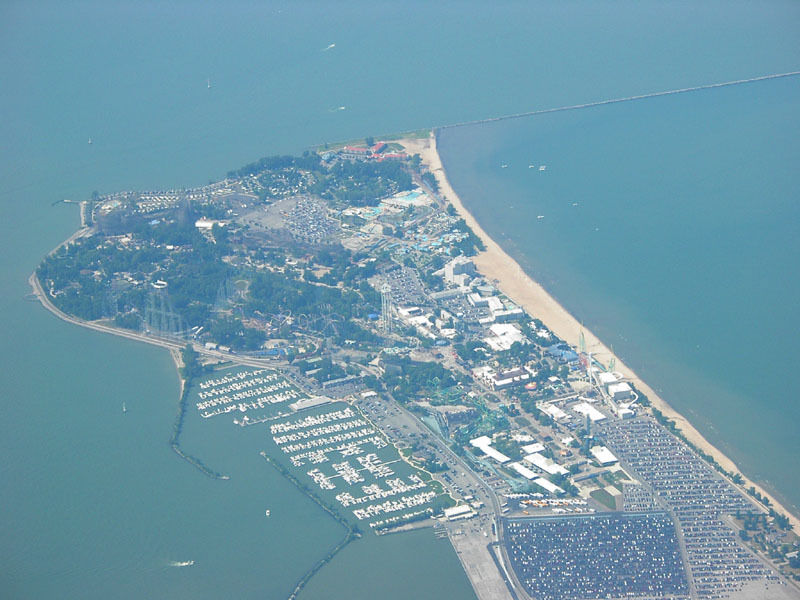 Shortly afterwards, we were nearing north-western Ohio, Sandusky to be exact, which is the home of Cedar Point. You can see lots of parked cars and even make out some of the roller coasters. Very cool. 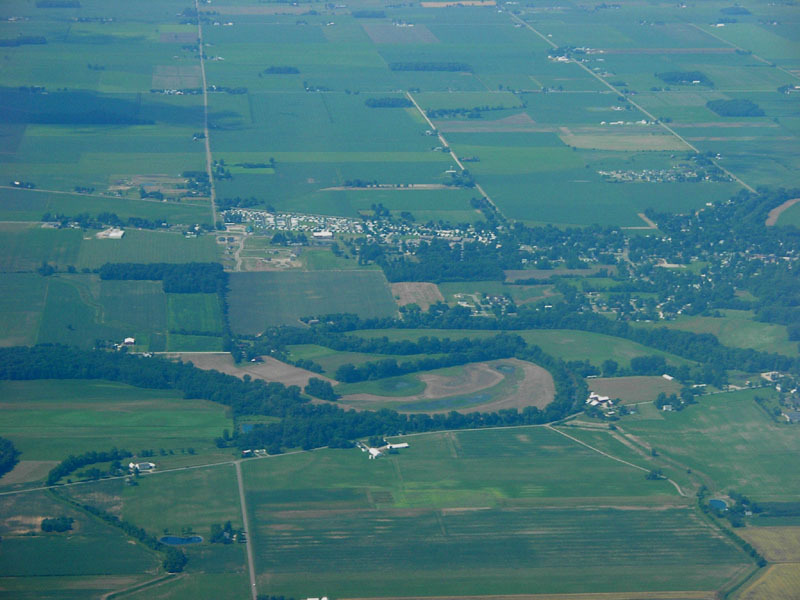 Once we got into Michigan, the landscape became even more rural: flat, rectangular, farmland. Every now and then there'd be a small city, like the one below. 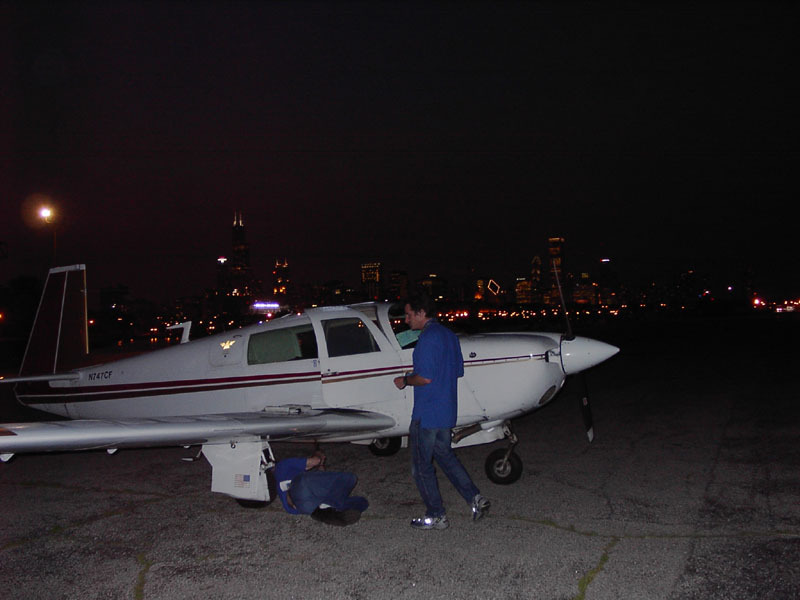 David flew this leg, and I served as the trusty co-pilot, trying to find some way to make myself useful. At least I have cool aviator sun-glasses...that counts for something, doesn't it? 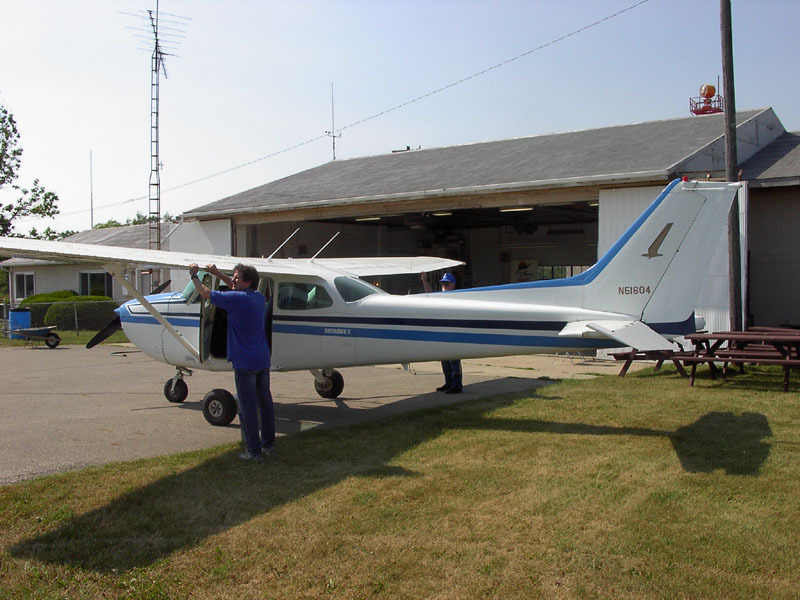 Our first stop was in Hillsdale, Michigan to take a look at a C-172 that was for sale. 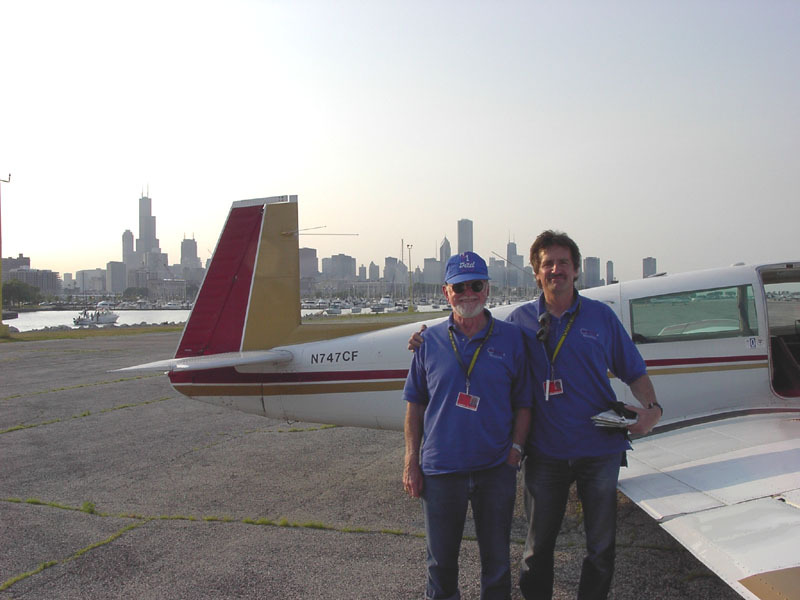 David and Stick thoroughly inspected the plane and took it for a test flight. The Hillsdale airport is a nice little airport. It was pretty damn hot standing around on the blacktop. 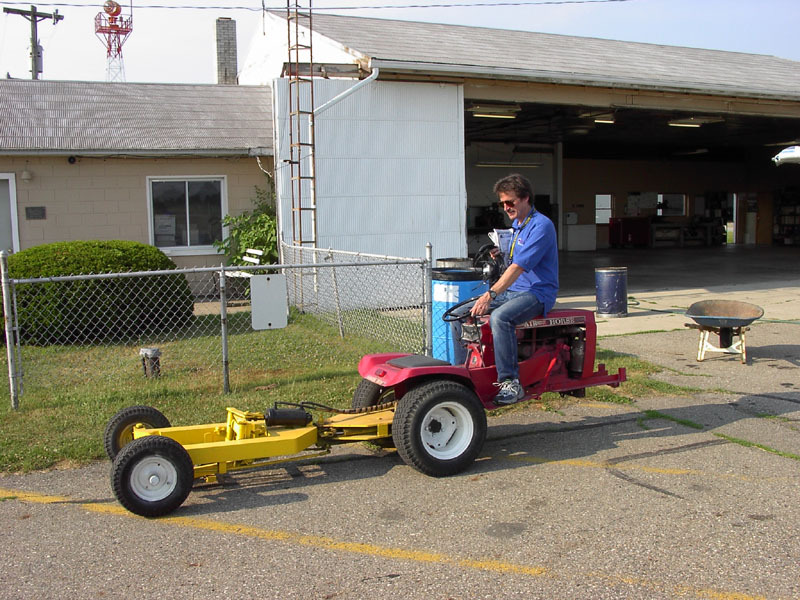 David liked the tug they had at the airport (sort of a hybrid tug/tractor). 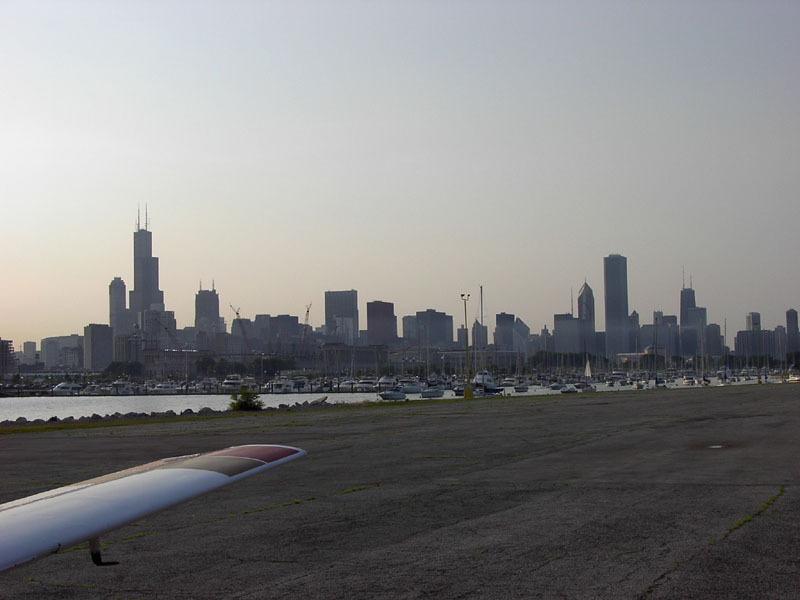 After checking out the plane, we then continued on to Chicago. 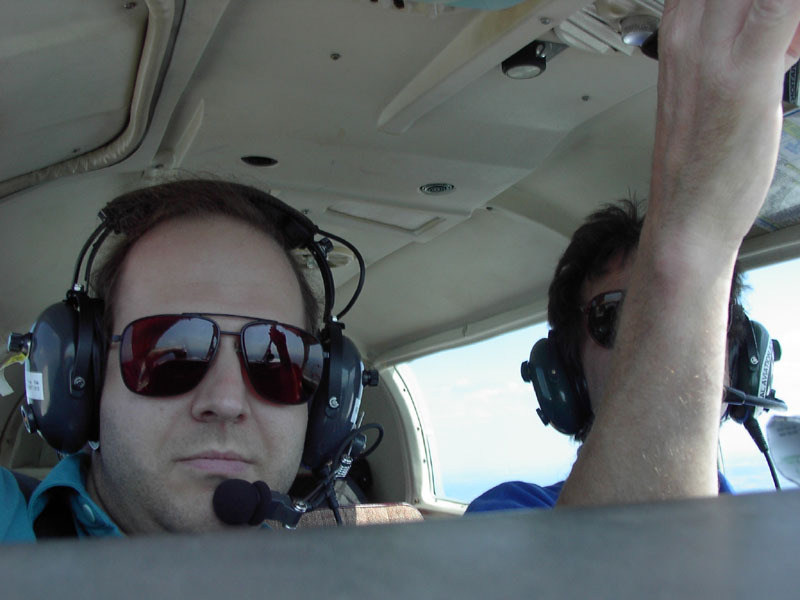 Stick was in the backseat, I was in the right seat, and David was the Pilot In Command. 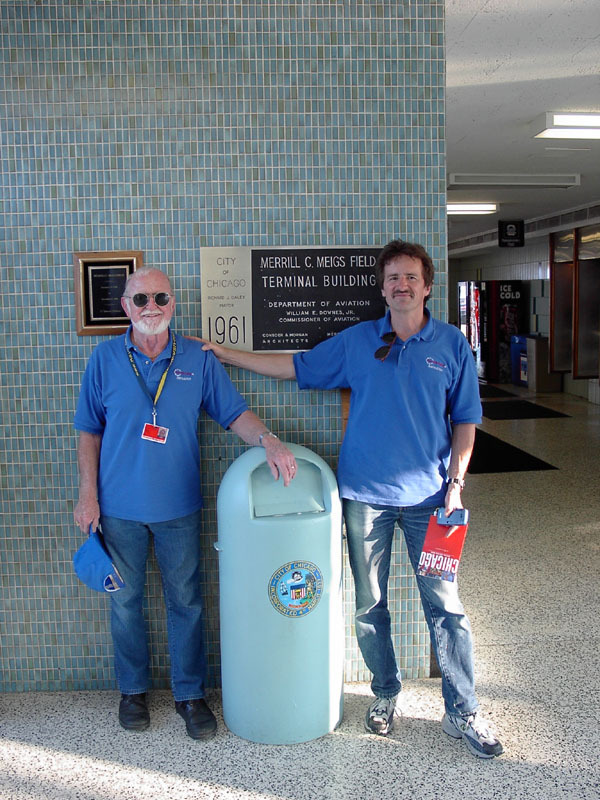 Merrill C Meigs Airport. 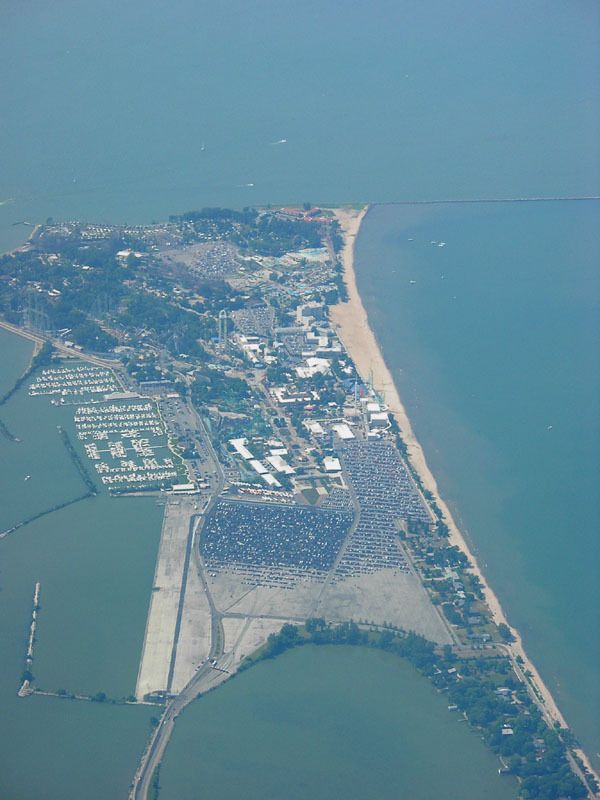 It's an aviation mecca. 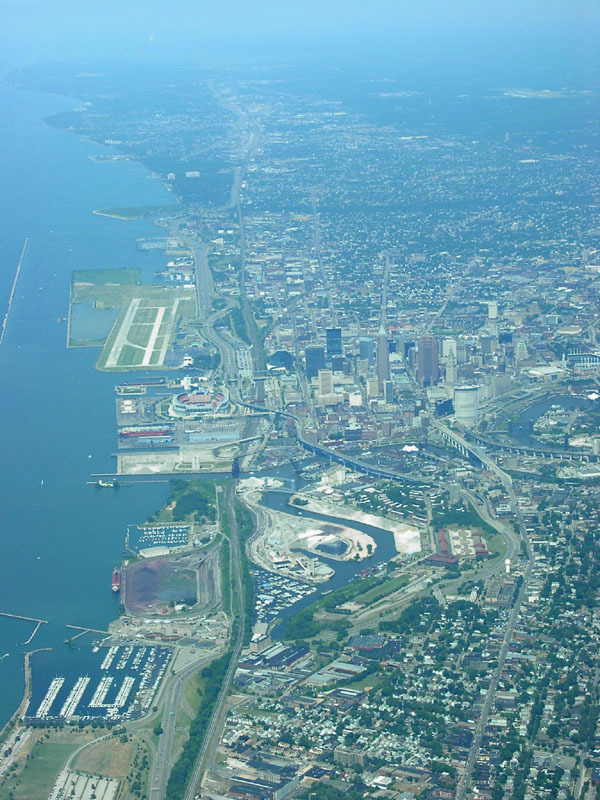 Located in the heart of one of the major cities in the country, providing fast, easy access to downtown, as well as an incredible view of the distinctive skyline, it's easy to understand the draw of Meigs. 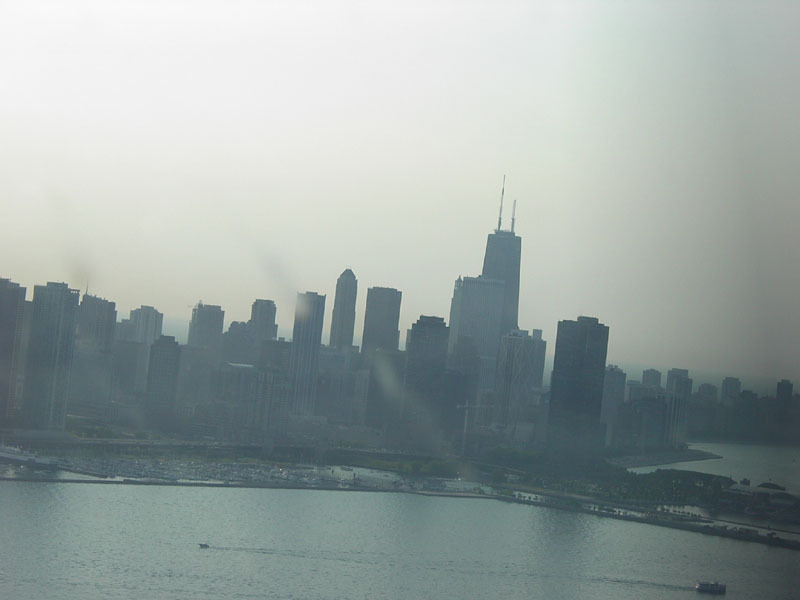 It was around 6:30pm, and we tried to contact Chicago approach. It was hopeless: the frequency was too congested. The few times there was a break long enough to say our call sign, it was obvious that the controller was way too busy to accept a VFR flight. 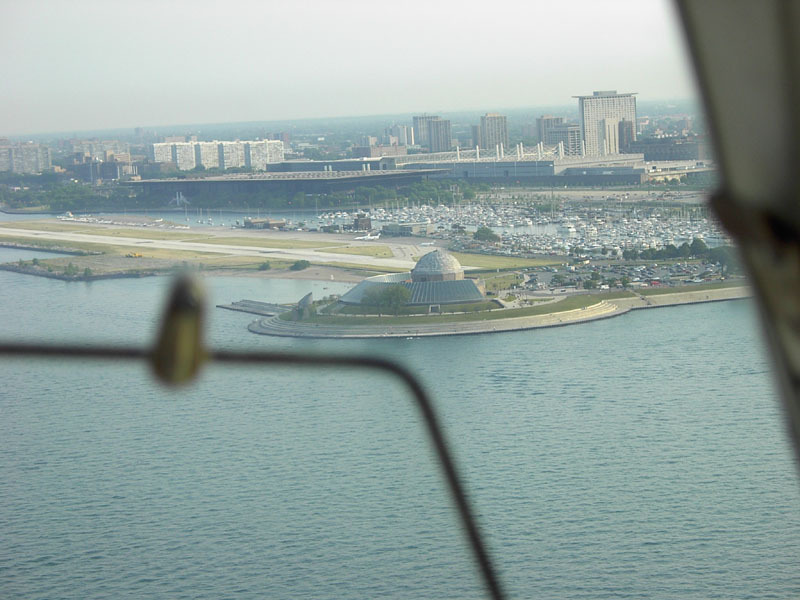 So instead, we flew under the Class B airspace, along the Lake Michigan shoreline and contacted Meigs tower, about 7 miles south of the airport. 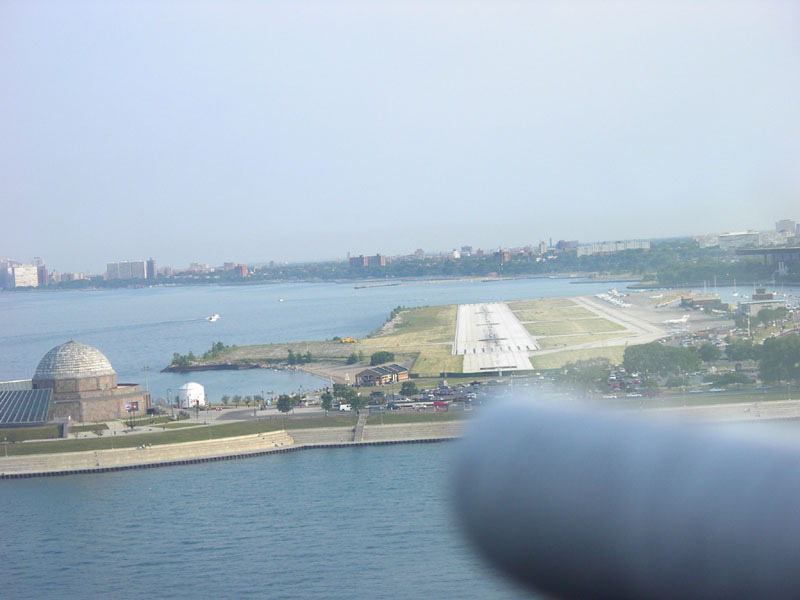 Meigs told us they were landing to the south, and to report when we were in a mid-field downwind position. About 3 minutes later we called up and were cleared to land. During those 3 minues there had been no other calls on the radio. O'Hare might have been in the middle of the Friday afternoon push, but Meigs was pretty quiet. 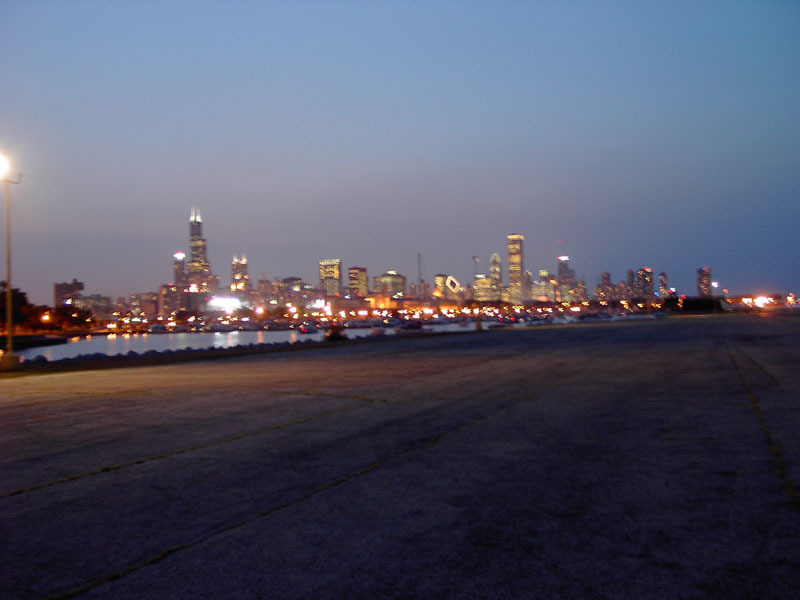 You can see photos taken from downwind, to base, to final approach landing on runway 36, a shot of the Chicago skyline visible from the parking at Meigs (both with and without David and Stick in the photo) and a shot from the FBO, which looks like a 1960's terminal (which is was). The tower told us that the airport closes promptly at 10pm and that they don't want people running out to their planes at 9:55pm, rushing a pre-flight, just to get out on time. The people in the FBO gave us a similar warning. Fortunately, we had gained an hour, so we had 3 hours to get something to eat and depart. 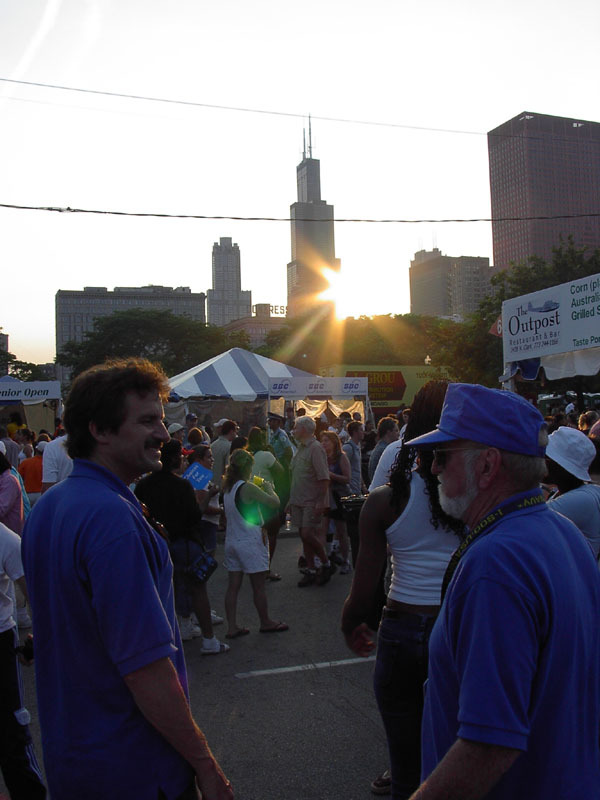 It just so happened that the Taste of Chicago festival started that Friday. 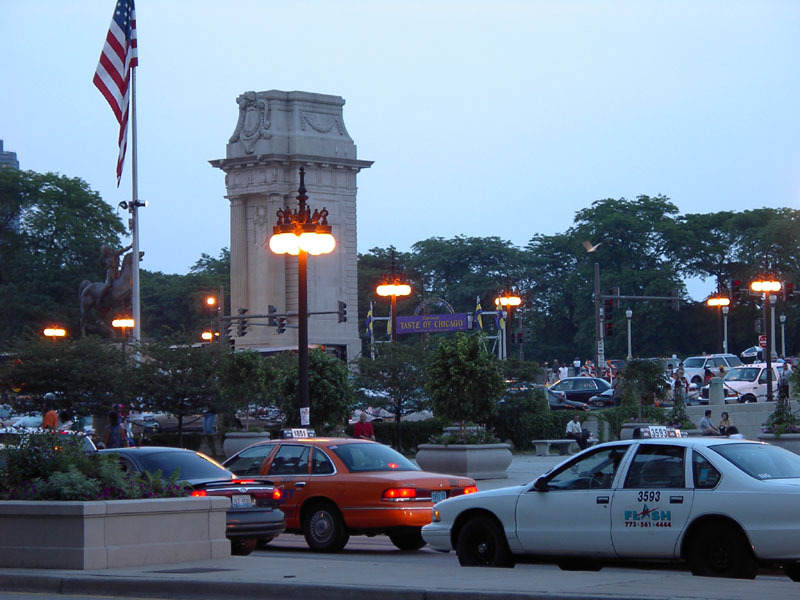 We took a cab to Grant Park, which was about 5 minutes away (walkable distance if we had a lot of time). 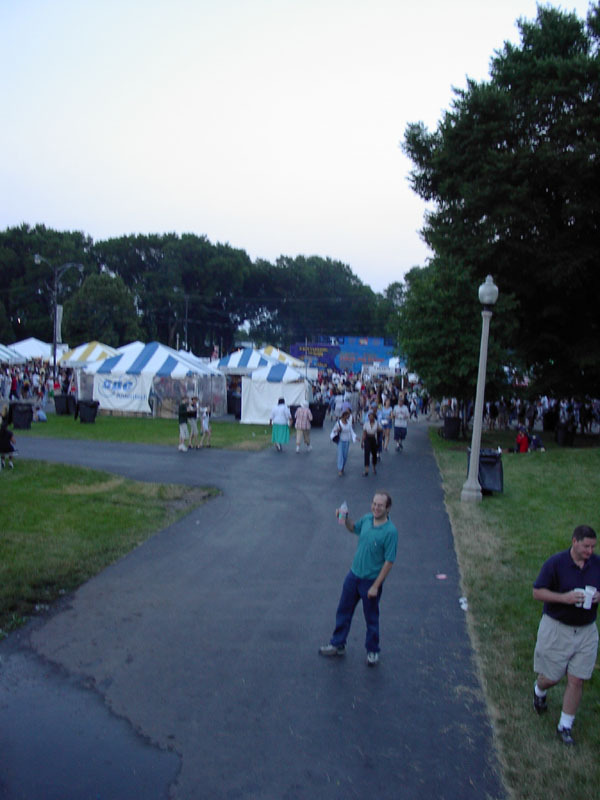 At the fest, we wandered around a bit. 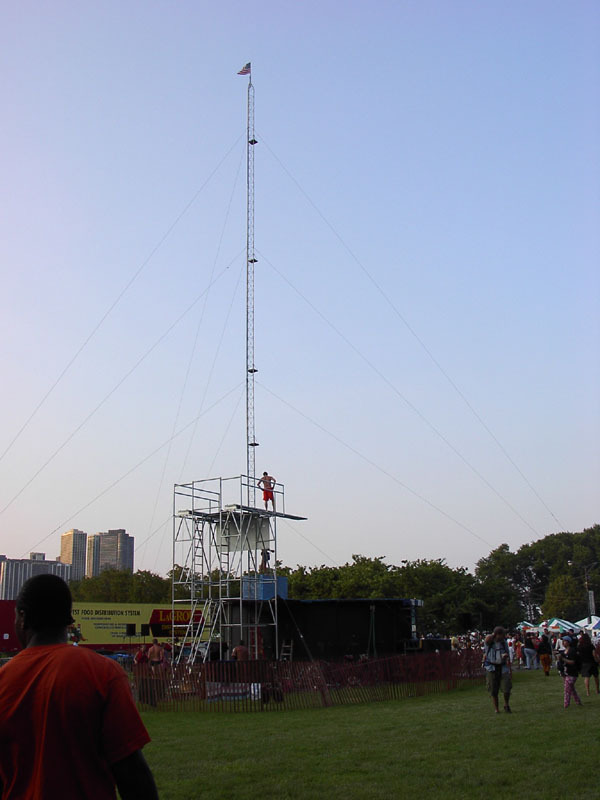 There were various entertainment acts, including different live music, and some high-diving (which just ended before we got there). 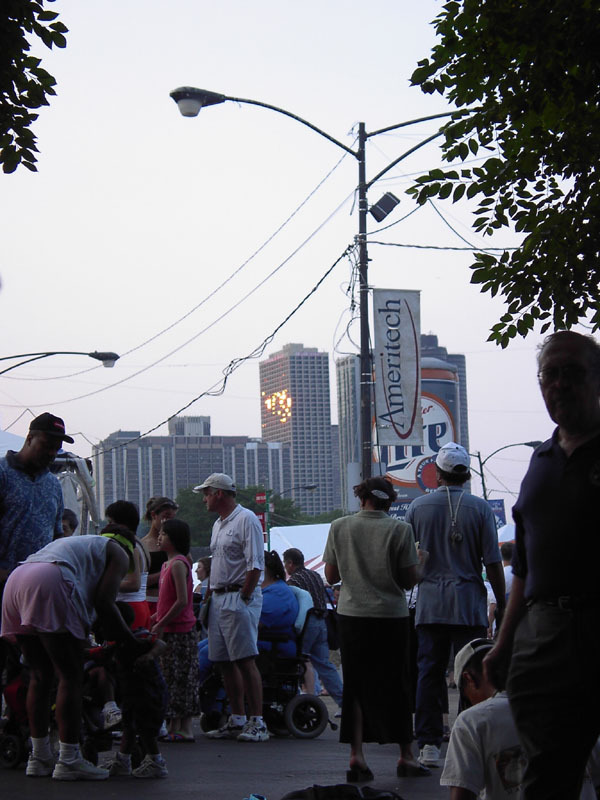 Many local area restaurants had booths and it was wall to wall people. 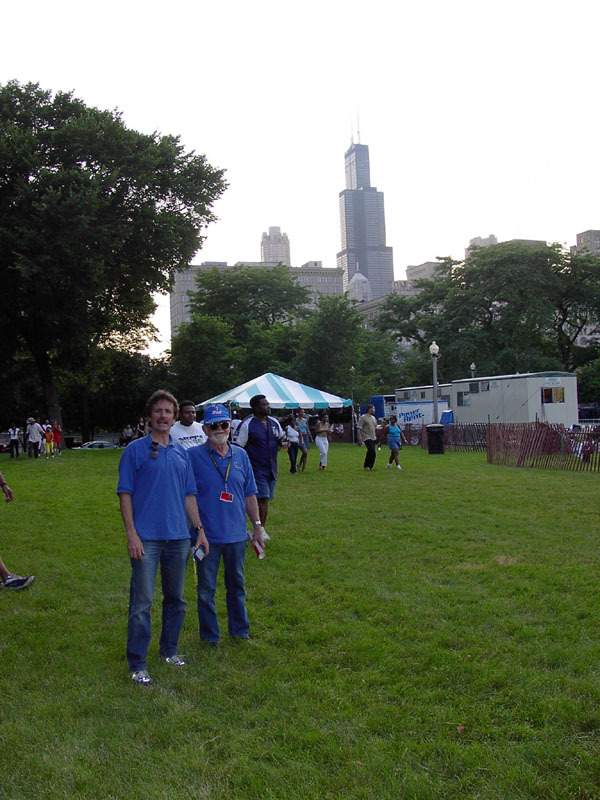 But since it had just started, it was clean and there was still a lot of grassy areas free and empty trash dumpsters. We ate and then (eventually) got a cab and headed back to Meigs. We got back around 9pm. We did some preparation, checked the weather (still pretty much clear), did a pre-flight inspection of the plane, and filed a flight plane. 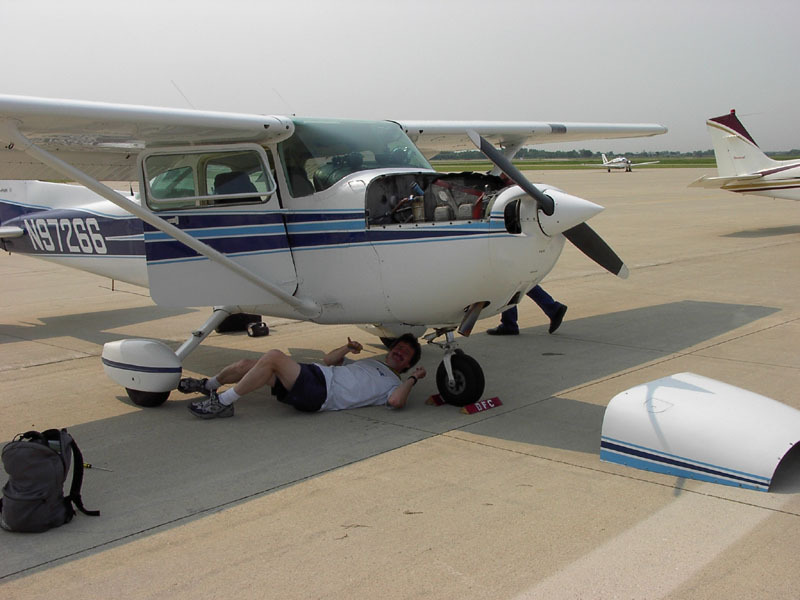 I was flying that leg and decided to go IFR. You see, there's pretty much only thing between Meigs and Dupage: O'Hare. I didn't want to mess around trying to follow highways and all that. I filed direct from Meigs to Dupage, figuring that they'd just radar-vector me anyway. The flight was simply amazing. 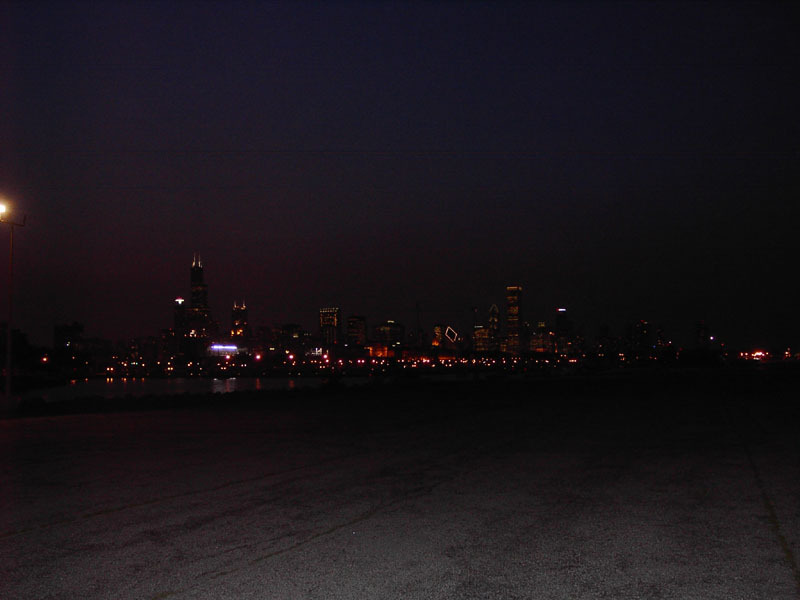 Chicago at night is a gridwork of lights, stretching as far as you can see in all for directions. 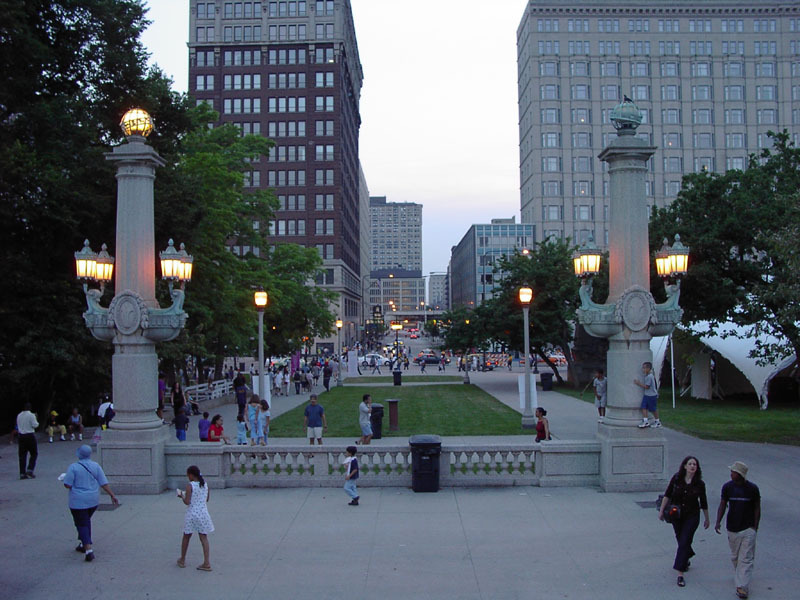 No curving, circular streets are visible. There were also at least 6 different fireworks displays visible as well. 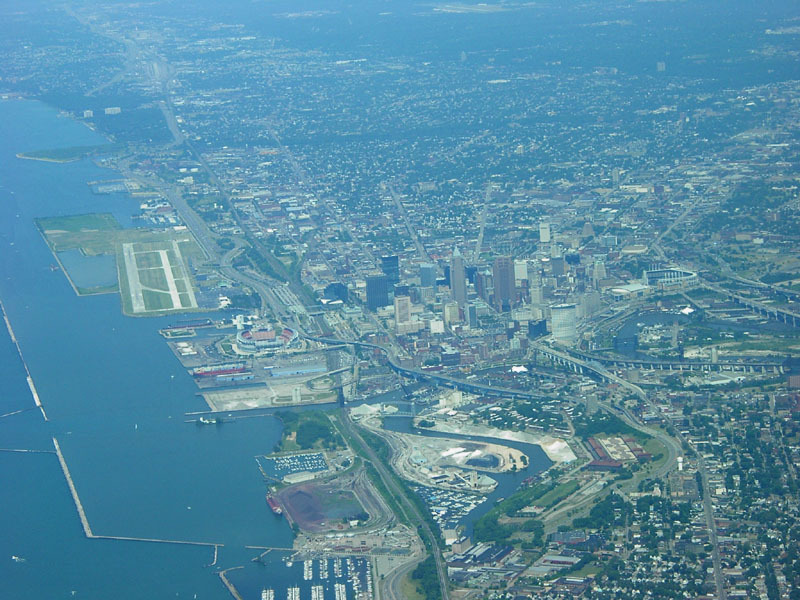 We took off to the south, headed out over the water just a little and then were turned westward, over the city. After perhaps ten minutes or so, we were approaching the airport. We spotted the beacon. 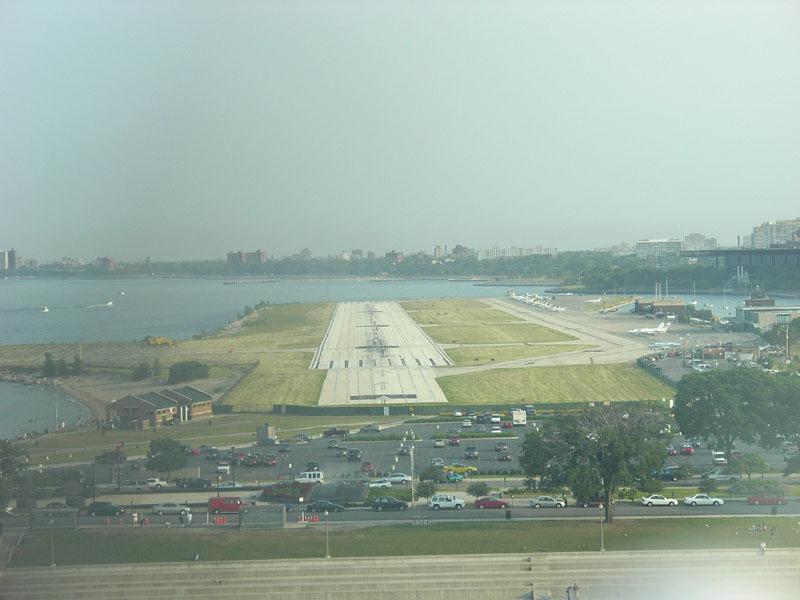 The only trick was finding the actual runway configuration. 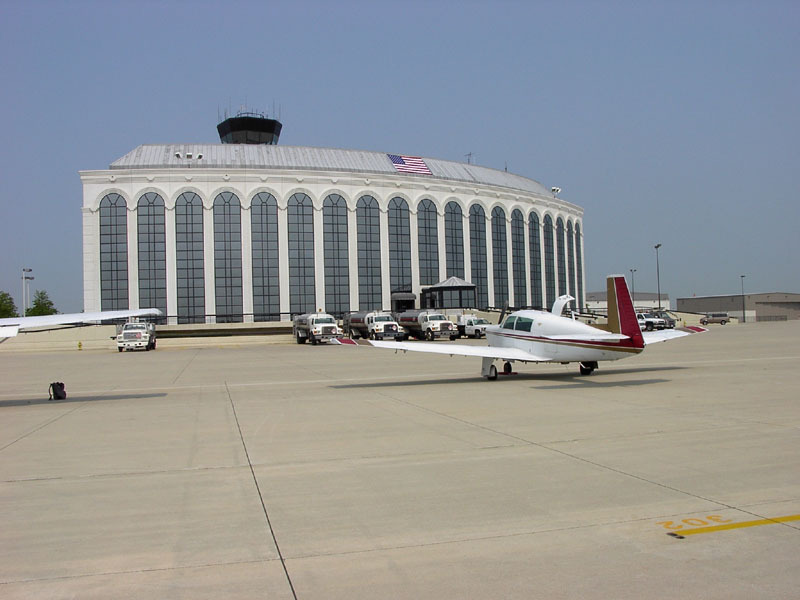 Dupage has a lot of runways. I asked the tower to turn up the lights, and eventually the 7,500' long monster runway 2L was visible (oh...I guess we're on a base leg to 2L...which means we're lined up for a final approach to 33...ooops). We taxied in and the FBO is big like the runway is big. 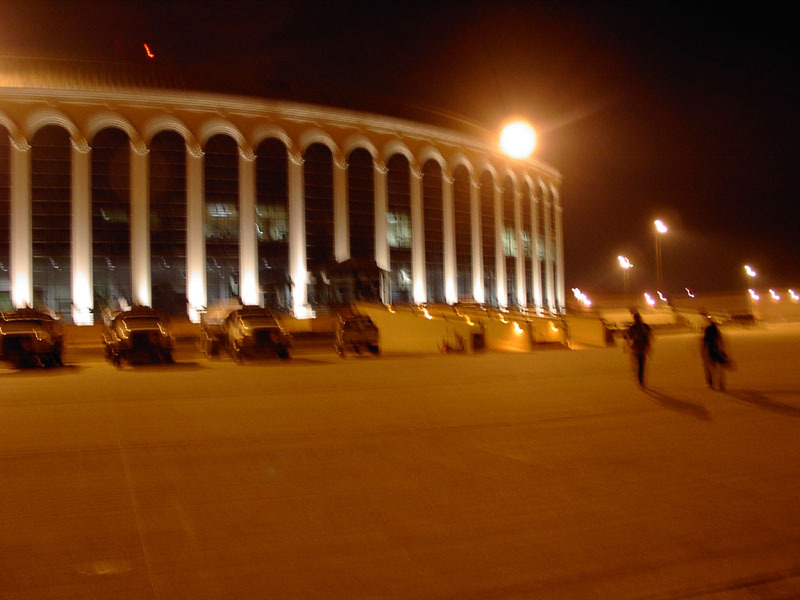 It's a 3 story, semi-circular building, lit up like some sort of Taj Mahal or Jefferson Memorial. We parked and got a hotel for the night (at the air-crew rate!). 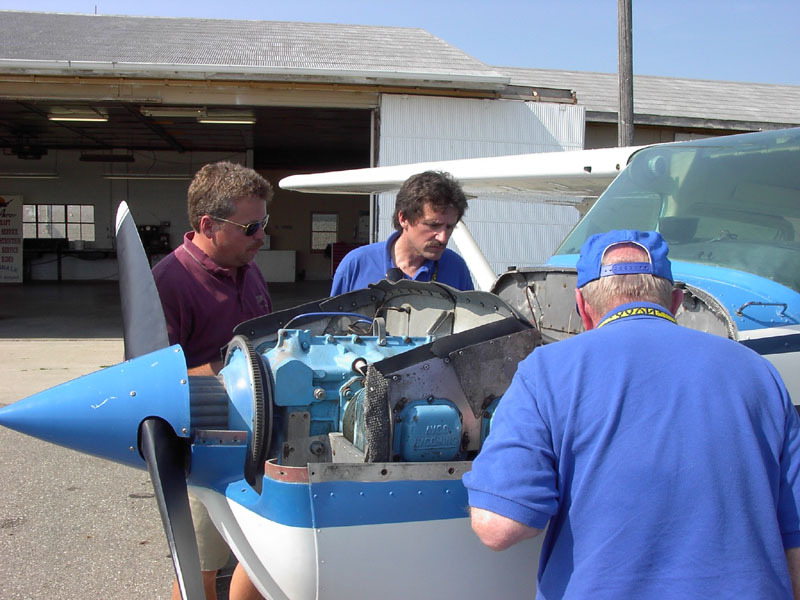 The next day, we examined the plane and again, Stick and David took it for a test flight. N79266 is a 1981 Skyhawk, white with a blue stripe, with a Garmin 195 IFR certified GPS. They were satisfied with it and thus the club bought another plane. The flight back was uneventuful. 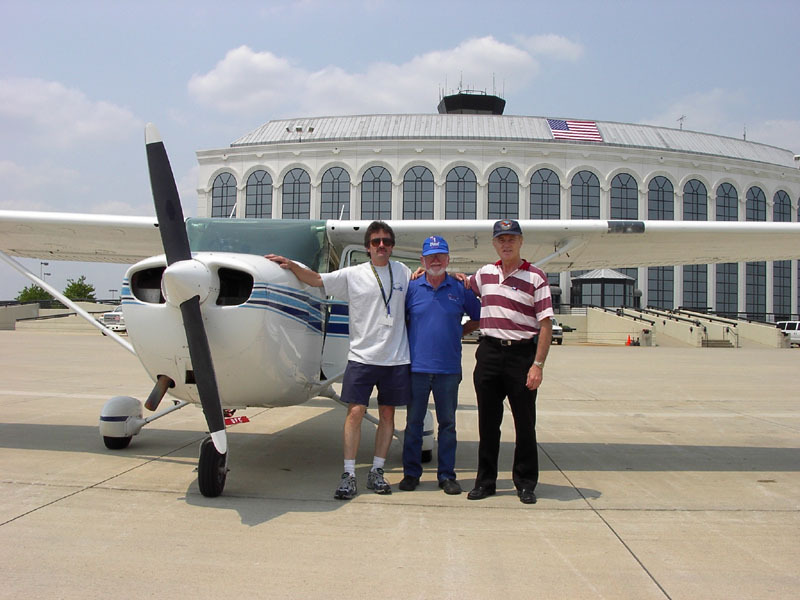 I flew the Mooney, David and Stick flew the 172. 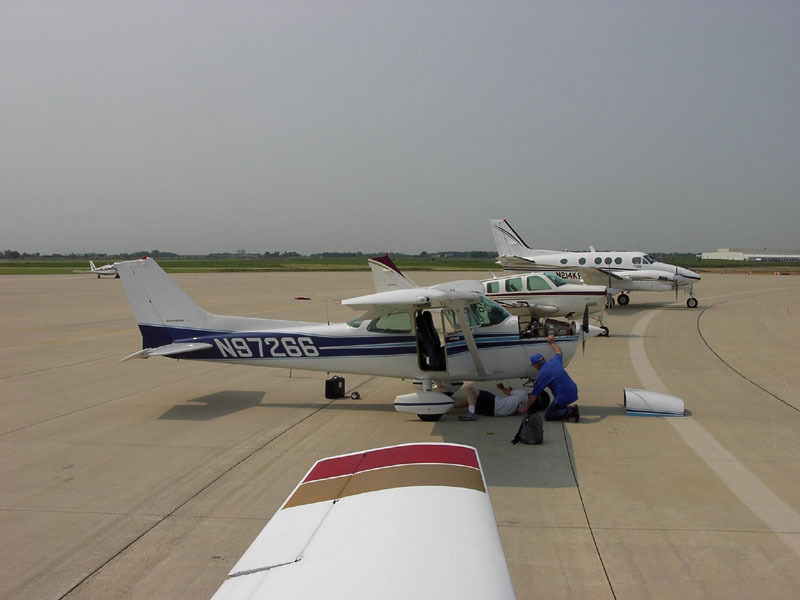 We flew VFR from Dupage south to clear the Class B airspace that was over us. 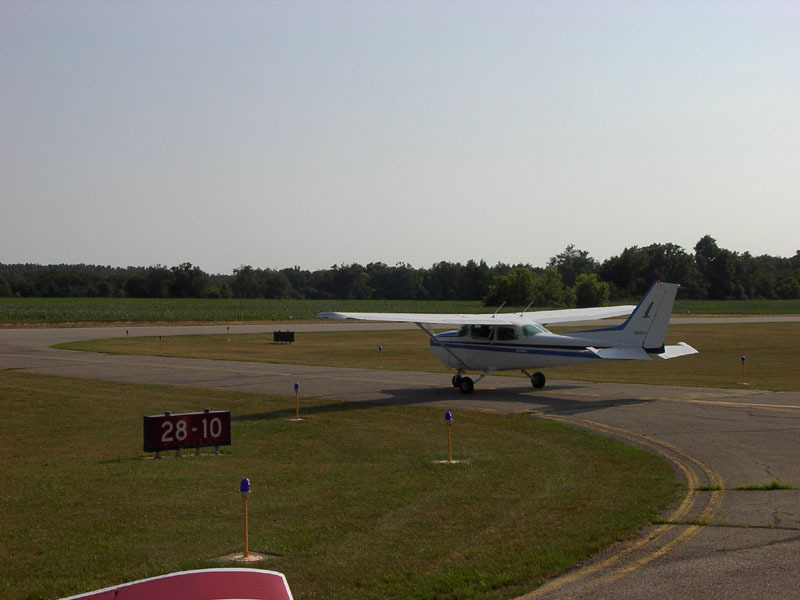 Then, since both planes were GPS-equipped, we flew direct to the destination: Wood County Airport in Blowling Green, Ohio. We figured this would be a good place to stop for gas so we could check the fuel burn on the 172 and we could get something to eat nearby. Around the Indiana/Ohio border, South Bend approach calls me and reports that there's company traffic a couple miles ahead at 1 o'clock. I tell them I'm looking for the traffic. I spot the traffic just as they are telling me that I should change my course if I don't see it. The 172 is about a mile away, to my right. I call "traffic in sight." It was pretty cool. We rocked wings at each other. I thought my camera was in the back of the plane, so I didn't look for it. Turns out ti was in my flight bag. Drat! I could have had a pretty cool picture of the plane in action. We were both at 7,500 and some clouds were approaching, so we both requested lower. The Mooney can go pretty fast in a descent, so I passed them at that point and didn't see them again until I was taxiing in (and they were taxiing in right behind me). After lunch/dinner, I left first, followed by them, climbed to 10,500' to climb above Cleveland's Class B airspace and flew direct to Ithaca. I heard them on the frequency, although they were getting a bit behind. 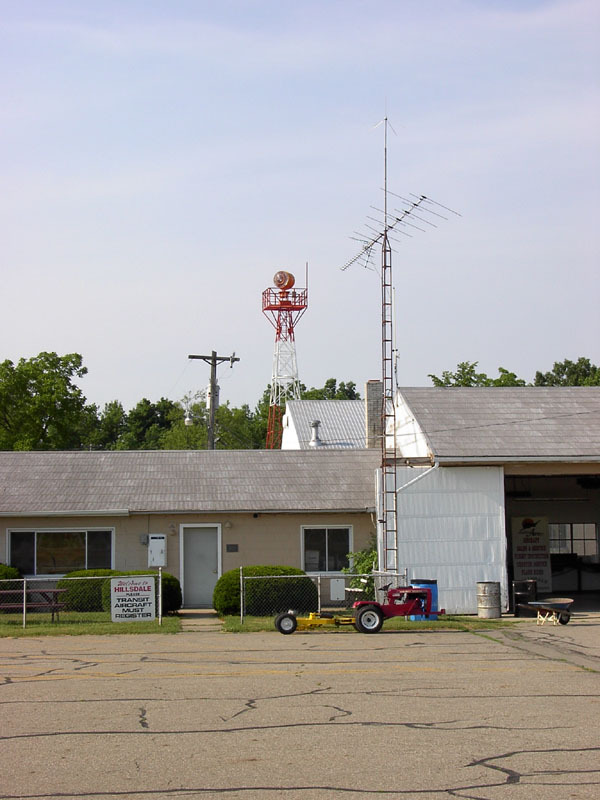 At one point, when David checked in with Cleveland Center, he asked if the Mooney was still on the frequency and requested a frequency change so we could talk. We reported our positions, how long till we got back, and then switched back to Center. It was slowly getting murkier. 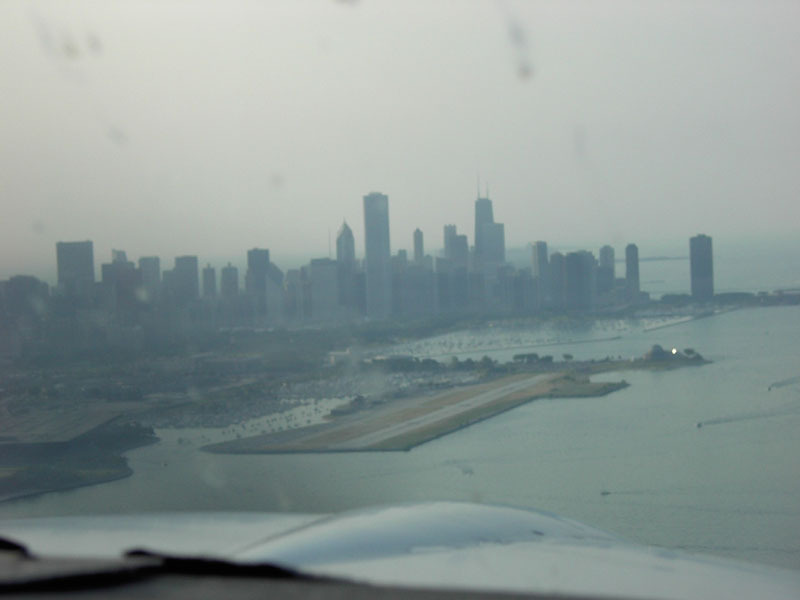 Still VFR, but just not great sightseeing weather, nor great photo weather. 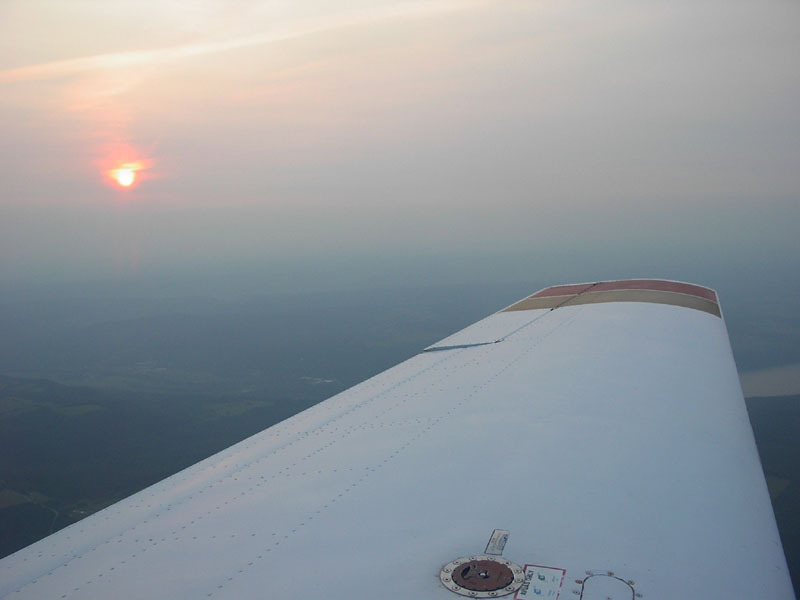 The only picture that came out was the sunset over the wing, while I was nearing Ithaca. I think I was over Keuka Lake at the time. I landed at Ithaca around 8:30 as the sun was a cherry-red ball, about as high as the control tower. They landed about a half-hour or so later, having tested the ILS on the plane. It was a pretty amazing trip.